It was a weekend of thinking and talking about trees & flowers & vines & growing things. Whitebud, hydrangea tree, weeping redbud, white wisteria, snow in summer, bridal wreath, edgy hearts, butterfly maple. The visit to a new nursery was a prayer answered in blossoms. There was the pulling up of the old - goodbye cast iron plants and oak seedlings - and the beginning of the new. Easter weekend the perfect time . One hole dug, one new burst of white in the dark corner of the yard, more to come. Hands in the dirt, roots at last gone, the sheer number of shovels and spades and clippers needed quite amazing. The area under the stairs is now free and clear, empty of everything except ideas, of which there are so many it is impossible to decide. Saturday evening the sky slowly went soft pink as we sat on the rock wall and relaxed from the day's work; she talked about those ideas and I listened and answered and usually agreed and Maggie sat between us and Miss Kitty laid in the yard, and the sky turned ever pinker, the air bursting with the scent of wisteria. Wisteria was/is everywhere, climbing phone poles and weaving amongst tree limbs. On the street a car stopped and what's that purple? a woman called; earlier 2 men walking by called the wisteria the biggest lilac tree they'd ever seen. We've laughed for two days. The tree above is an old redbud. The older they get, the more beautiful. I've never seen anything like this. Fascinating!! 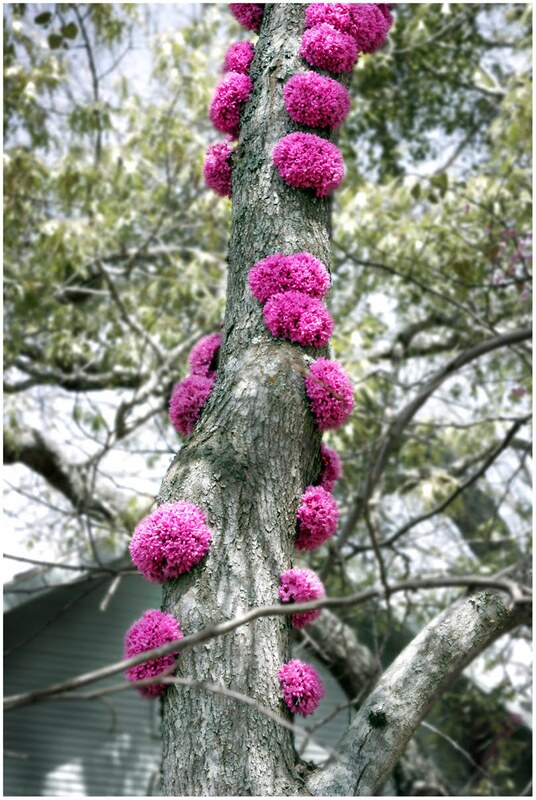 Loving that tree...it looks like someone spent the day pasting pom poms onto it...and yes, "the older they get, the more beautiful," I like that, too, how many seasons we survive, how many springs we look forward to, how many wonderful blossoms we sing out each year. wow....I just love it...and the fact that it's old and beautiful ! ps....your article was amazing ! oh my gosh....that picture just made my day! Thank you! i have never seen a redbud looking like that. the redbud is one of my all time favorite trees. I would love to see your white garden - i bet it's magical.